It was at this time Kevin began his fitness journey: He set new goals, started boxing and MMA training, and transitioned into obstacle-coarse racing and running. “It’s become a healthy lifestyle in so many ways other than just fitness,” he adds. Kevin has been teaching for 4 years. 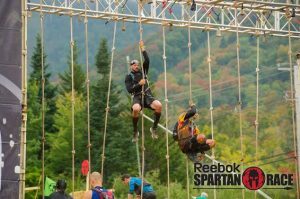 “Spartan Strong” on Tuesdays at 6:30pm is where you’ll find him coaching class attendees in a class environment preparing them for grueling Spartan Races.